New Japan’s G1 Climax tournament isn’t just a series of wrestling matches. It’s become the premier wrestling event of the year for fans of in-ring action, with 20 of New Japan’s top stars facing off in a round-robin tournament over four weeks in July and August. You can catch all the action on New Japan World, the company’s streaming network, which also features over 40 years of some of the best wrestling ever. The first night of this year’s G1 Climax 26 happened at the Hokkaido Prefectural Sports Center in Sapporo, Japan on Monday, and featured some surprising results and matches. 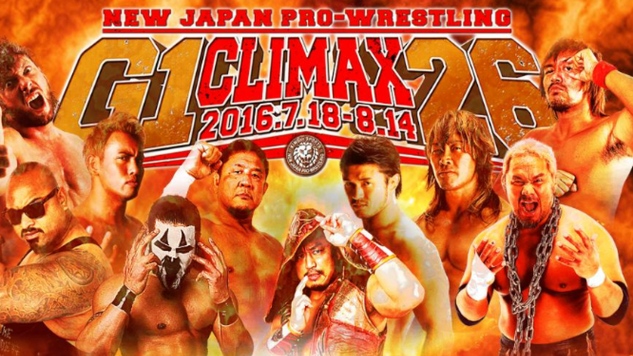 Here’s what we learned from the first night of the 2016 G1 Climax. If you’re a longtime fan you might remember Hiroyoshi Tenzan from his handful of appearances in WCW as a member of NWO Japan. The New Japan lifer maintains a full-time schedule at 45, usually teaming with long-time partner Satoshi Kojima. At his peak in the early to mid ‘00s he was one of New Japan’s biggest stars ever. He’s won the company’s top title, the IWGP Heavyweight Championship, four times. He’s held eleven IWGP Tag Team Championships with the likes of Kojima, Masa Chono and Osamu Nishimura. He’s won the G1 Climax three times, most recently in 2006. He’s a legend in New Japan, but his career is winding down, and his best days in the ring are well behind him. He was a late addition to this year’s G1 line-up, and initially many American fans weren’t too excited about seeing him in the tournament. So it’s pretty shocking that he had the best match of the night. His opponent, the hard-hitting Tomohiro Ishii, is one of the best in the world today, and Tenzan was able to pull himself up to Ishii’s level, resulting in a brutal slugfest that was a great start to the tournament. (Those back-and-forth head butts are about as inexcusable today as chair shots to the head, though.) Tenzan and Ishii worked a believably violent, relatively fast-paced match, and were also able to pull in the crowd more than perhaps any other match on the card, helping us prove our second point. As American wrestling gradually became more entertainment-focused in the 1980s and 1990s, New Japan and rival All Japan stood out more and more for continuing to portray themselves like a real sport. It’s still predetermined, and the wrestlers are still working together to tell a story and minimize injury, but New Japan angles and storylines tend to focus on wrestlers wanting to win titles and tournaments to prove they’re the best, with much less goofiness than you’ll see in WWE. The whole point of the weeks-long G1 tournament is winning a title match at the biggest show of 2017. That’s enough to get New Japan’s audience into the major shows and matches, but sometimes an extra story element can help a match or wrestler connect with the crowd even more. That’s part of why Tenzan’s match with Ishii extracted such a fantastic reaction from the audience. Tenzan’s playing the role of the former champion looking for one last bit of glory at the end of his career, and wasn’t even supposed to be in the G1 until his tag team partner Kojima gave him his spot. Tenzan’s now both the underdog and the emotional favorite for the New Japan audience. It’s similar to the storyline that ended Ric Flair’s WWE in-ring career in 2008, although without retirement as a guaranteed conclusion. Tenzan isn’t just fighting for a title match—he’s fighting for respect, for self-respect, and to prove he still belongs in the upper levels of New Japan, and the fans are right there with him, even though they have to know there’s little chance of Tenzan winning the G1. That story made his match with Ishii the most dramatic of the night, and will continue to elevate all of Tenzan’s matches to a level they probably wouldn’t have reached otherwise. The final two matches of the night featured New Japan’s two biggest stars, Hiroshi Tanahashi and the current IWGP Heavyweight Champion Kazuchika Okada. Tanahashi wrestled Sanada, the newest member of Los Ingobernables de Japon, who’s been in New Japan for about three months. Okada faced off against Naomichi Marufuji, who was in his first major NJPW singles match in almost three years. Okada and Tanahashi are rightfully recognized as two of the best wrestlers in the world, both in Japan and among America’s more passionate wrestling fans, and Sanada and Marufuji were both about as fantastic in these matches as Okada or Tanahashi. Neither man looked out of place against his more celebrated opponent, and both matches were triumphs of pacing and athleticism. The final moments of the Okada and Marufuji match were a lot like the end of last year’s famous Okada / AJ Styles match, with both men somehow having the strength and energy to reel off a complicated sequence of reversals and counters after twenty minutes of all-out action. And Sanada and a hurting Tanahashi combined for the second best match of the night, leaving us wondering how great they could be together if Tanahashi was fully healthy and if the goal was to have a blow-away main event on a major show. Longtime fans of Japanese wrestling know how talented Marufuji is, and now so do all the newer fans who have gotten into New Japan over the last couple of years. He and Sanada both proved they have more than enough talent to be major players in New Japan’s main event scene. Perhaps the most shocking thing about this show, for American fans, is that New Japan didn’t just let Sanada and Marufuji get over on their own abilities; they actually let them win their matches. They both beat a perennial New Japan main eventer and multiple time IWGP World Champion on the tournament’s first night. Neither wrestler is obscure in Japan—Marufuji especially has a long, illustrious career, making several appearances in New Japan in the past, winning the Junior Heavyweight Championships in both New Japan and rival promotion All Japan, and holding the GHC Heavyweight Championship in New Japan’s promotional partner NOAH three times. And Sanada is a former star in All Japan and Keiji Mutoh’s Wrestle-1 promotion, a member of the hot New Japan stable Los Ingobernables de Japon, and wrestled Okada in the semi main event of a New Japan show back in May. Still, it’s surprising to see both of New Japan’s two aces lose in the same night, especially to one wrestler who’s relatively new to the promotion and another who’s not a New Japan full-timer. With the loss of Shinsuke Nakamura and Styles to WWE, and Tanahashi’s advancing age and injuries, New Japan has to build credible new stars for the main event mix, and the first night of the G1 showed they aren’t afraid to have their top two draws lose in the process. Tama Tonga has a great look and flashes tremendous athleticism. Bad Luck Fale is an intimidating presence and a great bodyguard to have in a heel’s corner. WWE was smart not to target them when the company raided New Japan earlier this year, though. They were involved in the first night’s two least impressive G1 matches, with Tonga losing to Togi Makabe in an uneventful brawl and Fale falling to Hirooki Goto after about ten forgettable minutes. Not every G1 match can be a blow away, but in their many years in New Japan neither Tonga nor Fale has shown the ability to consistently have great matches, and that’s with New Japan’s roster of world class wrestlers. They would probably both struggle in WWE, especially since the factors that make them unique in New Japan wouldn’t stand out as much in WWE. It wouldn’t be surprising to see other current Bullet Club members like Kenny Omega, the Young Bucks and Cody Hall in WWE eventually (really, it feels inevitable for all four), but Tonga and Fale are better off in Japan. Garrett Martin edits Paste’s wrestling, games and comedy sections. The closest he’s been to seeing a New Japan show in person was when he saw Jushin Liger at the Omni a couple of times in 1992. He’s on Twitter @grmartin.